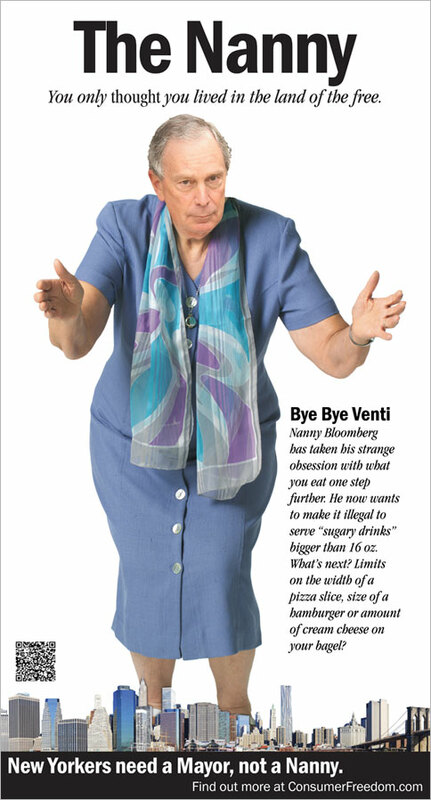 As if New Yorkers didn't have enough unpleasantness in their lives, now they've facing a ban on the sale of sugary drinks larger than 16 ounces … and they've been assaulted by this picture of mayor Michael Bloomberg in drag. The Photoshopped depiction of the mayor as an overly controlling nanny appeared in a full-page ad in Saturday's New York Times. Bloomberg proposed the ban (covering restaurants, theaters, sports arenas and street vendors) to fight obesity and generally annoy the local population. The ad warns readers, "You only thought you lived in the land of the free." It was placed by the nonprofit pro-restaurant-industry Center for Consumer Freedom, which does not disclose its funding sources. City Hall spokesman Marc LaVorgna blasted the ad: "It says an awful lot about the state of the soda industry that a tobacco company front group is attacking Mike Bloomberg on their behalf. This is the same organization that was founded to oppose bans of smoking in restaurants and bars." He doesn't mention that the mayor looks awfully hippy in that skirt—from too many supersized Fantas, perhaps. Thank goodness Bloomers isn't trying to revive Prohibition, because Gothamites will need a few rounds to wash that image from their minds.